Let's Make A Game is another new platformer based puzzle game from keybol. 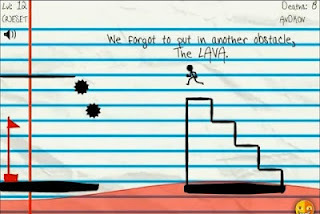 This game is about making a game starting from a stick figure and a line to walk on. From there you will be told what to do, just follow the directions. You will find pretty much everything your need to make a game in here from movable boxes, bottomless pits, razor saws and double jump skill. Let's Make A Game aka How To Make A Game is overall pretty good - simple yet fun and challenging at the same time which are important factors for platformer puzzle games. I personally love the twists where you will have to focus really hard in order to pass the level. Meanwhile, here is Let's Make A Game walkthrough showing all levels solution.